The bedroom is where you will spend a lot of your time and not only for sleeping. This is why it’s essential to have a suitable light fixture in your bedroom so that you can be comfy and cosy with a relaxing atmosphere in your room. 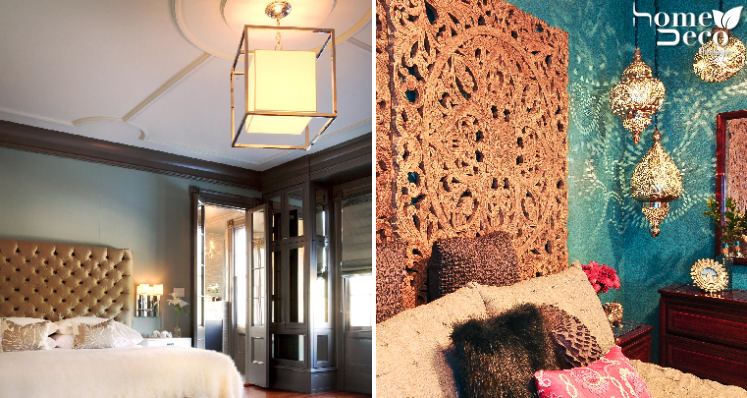 Here are some great ideas to brighten your room while still being stylish and trendy. A pendant lamp is a cool twist on having fussy chandeliers as it generally consists of only one bulb and looks much neater. Instead of choosing a boring-looking one, you can try this pretty pendant lamp to create a great focal point in your room. If you truly want a unique touch in your room then this Moroccan lanterns might be just what you are looking for. They have intricate patterns that allow the light to filter through that throws beautiful shapes around the room. Pendant lamps are so fashionable and trendy but this modern twist on these lamps allow you to be as bold as you want with your bedroom decor. The clear material of the lamps adds a contemporary touch without being overpowering. Not all chandeliers are the traditionally fussy and heavy things that you may have come to know. Instead, they can be quirky and full of character, just like this gorgeous light fixture in this bedroom that looks really interesting. A really easy way to make your bedroom’s lights look really good is to match them with your wallpaper or the colour of your walls. This is a classic way that will never go out of style and you can experiment with a few colours if you have a patterned wallpaper. If you’re looking for something that is fun, casual and attracts attention then the bubble lights will be a great choice for you. You can choose if you want to go with some colour or go the clear route to inject some modern feel into your bedroom.